Our Lord looked down upon the city twice. Once, from Mount Olivet, and He weeps for it. And once, from Mount Calvary, and He bleeds for it. Another mini-masterpiece, Micki - and, Ooo, those wounds look so sore! It does us no harm to be reminded frequently what He endured for us. Father Manton's quote is a treasure as usual and the holy card is a meditation piece. Truly, how much He loves us! Did you ever have the opportunity to hear Fr. Manton preach? He was truly one of the greats. His books are his actual sermons, but to hear him... he was truly gifted. "Jesus is lifted up on the cross and dies." 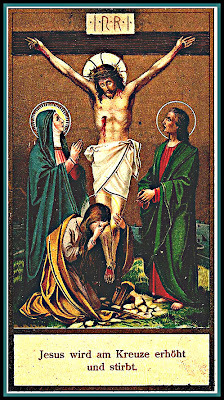 Lynneda - Yes, and isn't that was Lent all about, to remind us of what he did for us? D.S. - It is mind blowing to truly recognize the vastness of His love. Fr. Scott - Ohhh, I'm so happy to "meet" someone who actually has heard his speak. I love his writing so I know I would have been even more inspired to have heard him. Was he from MA too? John - How we all benefit from your knowledge. Thank you. Fr. Manton was from Brooklyn, NY. After ordination he was sent to Immaculate Conception Church in the Bronx. After a short time he was sent to Our Lady of Perpetual Help (Mission Church) in Boston as a temporary assignment. He remained there for the rest of his life. I heard him preach often at the Wednesday Novena services, both live and on the radio. When I was a student I was assigned there for the summer and he was pretty much retired by then. He has since died.